Microsoft grabs a good deal of user data via Windows 10 – something we heard about last week when French authorities blasted Redmond for what it described as "excessive" data collection – but there is a more positive side to this data hoovering, certainly for businesses when it comes to upgrading to the new OS. Upgrading is one thing for home users, but planning a full upgrade for a company is a whole other kettle of fish, involving potentially thorny problems particularly around legacy apps which may be business critical, and uncertainty about whether they might be compatible with Windows 10. Which is why Microsoft has introduced Upgrade Analytics, which employs data drawn from the Windows 10 user base to give firms pondering an upgrade insights into how their apps and drivers are likely to shape up. Redmond notes that Upgrade Analytics offers a fully up-to-date database of apps and drivers, detailing known issues, and also help on how you can deal with said problems. You also get a method of tracking whether a particular app or driver in your business is Windows 10-ready, and information on whether (or not) individual PCs are ready for the new OS. The system is now available as a public preview. 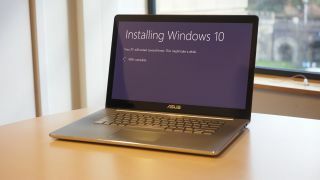 As for the aforementioned flak fired at Microsoft by the French watchdog CNIL, the company has said that it intends to work closely with the regulatory body over the next few months to move towards a solution it will find acceptable in terms of Windows 10's data collection.